Pinatubo is most notorious for its Volcanic Explosivity Index (VEI) 6 eruption on June 15, 1991, the second-largest terrestrial eruption of the 20th century after the 1912 eruption of Novarupta in Alaska. Complicating the eruption was the arrival of Typhoon Yunya, bringing a lethal mix of ash and rain to towns and cities surrounding the volcano. Predictions at the onset of the climactic eruption led to the evacuation of tens of thousands of people from the surrounding areas, saving many lives. Surrounding areas were severely damaged by pyroclastic surges, ash falls, and subsequently, by the flooding lahars caused by rainwater re-mobilizing earlier volcanic deposits. This caused extensive destruction to infrastructure and changed river systems for years after the eruption. 2, bringing vast quantities of minerals and toxic metals to the surface environment. It injected more particulate into the stratosphere than any eruption since Krakatoa in 1883. Over the following months, the aerosols formed a global layer of sulfuric acid haze. Global temperatures dropped by about 0.5 °C (0.9 °F) in the years 1991–93, and ozone depletion temporarily saw a substantial increase. The location of Mount Pinatubo and the regional ash fallout from the 1991 eruption. The volcano is 87 km (54 mi) northwest of Manila, the capital of the Philippines. Near Mount Pinatubo, the United States maintained two large military bases in the region. The U.S. Naval Base Subic Bay was 37 km (23 mi) south of Pinatubo, and the extent of Clark Air Base was just 14 km (8.7 mi) east of the volcano's summit. The volcano is near to about 6 million people. Mount Pinatubo's summit before the 1991 eruption was 1,745 m (5,725 ft) above sea level, only about 600 m (2,000 ft) above nearby plains, and only about 200 m (660 ft) higher than surrounding peaks, which largely obscured it from view. It is part of a chain of volcanoes which lie along the western side of the island of Luzon called the Zambales Mountains. Pinatubo belongs to the Cabusilan sub-range of the Zambales Mountains, which consists of Mt. Cuadrado, Mt. Negron, Mt. Mataba and Mt. Pinatubo. They are subduction volcanoes, formed by the Eurasian Plate sliding under the Philippine Mobile Belt along the Manila Trench to the west. Mount Pinatubo and the other volcanoes on this volcanic belt arise due to magmatic occlusion from this subduction plate boundary. Pinatubo is flanked on the west by the Zambales Ophiolite Complex, which is an easterly-dipping section of Eocene oceanic crust uplifted during the late Oligocene. The Tarlac Formation north, east and southeast of Pinatubo consists of marine, nonmarine and volcanoclastic sediments formed in the late Miocene and Pliocene. The most recent study of Mount Pinatubo before the activities of 1991 was the overall geological study in 1983 and 1984 made by F. G. Delfin for the Philippine National Oil Company as part of the surface investigations of the area before exploratory drilling and well testing for geothermal energy sources in 1988 to 1990. He recognized two life histories of the mountain, which he classified as "ancestral" and "modern" Pinatubo. Activity of Ancestral Pinatubo seems to have begun about 1.1 million years ago and probably ended tens of thousands of years or more before the birth of "modern" Pinatubo. Much of the rugged land around the present volcano consists of remnants of "ancestral" Pinatubo. It was an andesite and dacite stratovolcano whose eruptive activity was much less explosive than modern Pinatubo. Its center was roughly where the current volcano is. The projected height of the mountain is up to 2,300 m (7,500 ft), or 1.43 miles above sea level if it were a lone peak, based on a profile fitting to the remaining lower slopes, or lower if it had more than one peak. The old volcano is exposed in the walls of an old 3.5 km × 4.5 km (2.2 mi × 2.8 mi) wide caldera, referred to as Tayawan Caldera by Delfin. Some of the nearby peaks are the remnants of ancestral Pinatubo, left behind when the softer parts of the old mountain slopes were eroded by weathering. Ancestral Pinatubo is a somma volcano with modern Pinatubo as the new cone. Mount Dorst, to the east, is part of the dip slope of the ancestral Pinatubo. Several mountains near modern Pinatubo are old satellite vents of ancestral Pinatubo, forming volcanic plugs and lava domes. These satellite vents were probably active around the same time as the ancestral volcano and include the domes of Mount Negron, Mount Cuadrado, Mount Mataba and the Bituin and Tapungho plugs. c. 33,000 BC: After a long period of dormancy, Modern Pinatubo was born in Ancestral Pinatubo's cataclysmic and most explosive eruptions, estimated to be five times larger than the June 1991 eruption. It deposited all around the volcano up to 25 km3 (6.0 cu mi) of pyroclastic surge material up to 100 metres (330 ft) thick. The total volume of volcanic material ejected during the eruptions is unknown. The removal of so much material from the underlying magma chamber resulted in the Tayawan caldera. The violent eruptive period started by the eruption is referred to by Delfin as the Inararo Eruptive Period, named after a village that was destroyed in the 1991 eruption. c. 7000 BC (Pasbul Eruptive Period). Its eruptions were as energetic, if not as voluminous as the Inararo eruptions. c. 4000–3000 BC (Crow Valley Eruptive Period). This and the Mara-unot period's eruptions were smaller than the Inararo eruptions but about two to three times as big as that of 1991 based on the pyroclastic flow runout distances and depths of valley filling. c. AD 1500 (Buag Eruptive Period). Its eruptions were roughly the same size as those of 1991. Each of these eruptions seems to have been very large, ejecting more than 10 km3 (2.4 cu mi) of material and covering large parts of the surrounding areas with pyroclastic flow deposits. Some eruptive periods have lasted decades and perhaps as much as several centuries and might appear to include multiple large explosive eruptions. The maximum size of eruptions in each eruptive period though has been getting smaller through the more than 35,000-year history of modern Pinatubo, but this might be an artifact of erosion and burial of older deposits. The oldest eruption of modern Pinatubo, Inararo, was also its largest. The 1991 eruption was among the smallest documented in its geologic record. The volcano has never grown very large between eruptions, because it produces mostly unwelded, easily erodible deposits and periodically destroys the viscous domes that fill its vents. 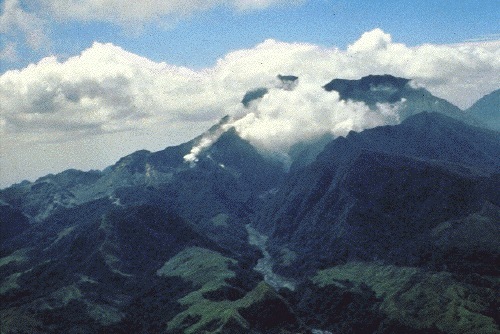 After the Buag eruption (c. 1500 AD), the volcano lay dormant, its slopes becoming completely covered in dense rainforest and eroded into gullies and ravines. The c. 500-year repose though between the Buag and present eruptive periods is among the shorter repose periods recognized in its geologic history. On July 16, 1990, the major 1990 Luzon earthquake of magnitude 7.7 struck northern Central Luzon and the Cordilleras. This was the largest earthquake recorded in 1990, comparable in size to the 1906 San Francisco earthquake and the 2008 Sichuan earthquake. Its epicenter was in the municipality of Rizal, Nueva Ecija, about 100 km (62 mi) northeast of Pinatubo, and faulted northwest-southeast through three provinces. 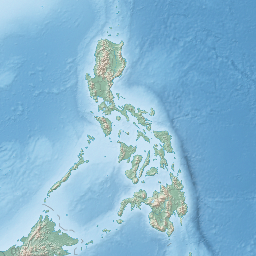 It also followed the Philippine Fault System west as far as Baguio City, which was devastated, and is located about 80 km (50 mi) north-northeast of Pinatubo, leading volcanologists to speculate that it might ultimately have triggered the 1991 eruption, although this is impossible to prove conclusively. Two weeks after the earthquake, local residents reported steam coming from the volcano, but scientists who visited there in response found only small rockslides rather than any pre-eruptive activity. On March 15, 1991, a succession of earthquakes was felt by villagers on the northwestern side of the volcano. Further earthquakes of increasing intensity were felt over the next two weeks, and it became clear some kind of volcanic activity was likely. On April 2, the volcano awoke, with phreatic eruptions occurring near the summit along a 1.5 km (0.93 mi) long fissure. Over the next few weeks, small eruptions continued, dusting the surrounding areas with volcanic ash. Seismographs recorded hundreds of small earthquakes every day. Scientists immediately installed monitoring equipment and analyzed the volcano for clues as to its previous eruptive history. Radiocarbon dating of charcoal found in old volcanic deposits revealed the last three major explosive eruption periods in recent millennia, about 5500, 3500 and 500 years ago. Geological mapping showed that much of the surrounding plains were formed by lahar flood deposits from previous eruptions. 2 being emitted decreased substantially, raising fears that the degassing of the magma had been blocked somehow, leading to a pressure build-up in the magma chamber and a high likelihood of violent explosive eruptions. The first magmatic eruptions occurred on June 3, and the first large blast on June 7 generated ash columns 7 km (23,000 ft) high. The Philippine Institute of Volcanology and Seismology (PHIVOLCS) immediately issued a warning indicating the possibility of a major eruption within two weeks. A map of Mt Pinatubo showing nearby peaks and the evacuation zones. Given all the signs that a very large eruption was imminent, PHIVOLCS – assisted by the U.S. Geological Survey (USGS) – worked to convince local inhabitants of the high severity of the threat. A false warning might have led to cynicism about any later warnings, but delaying a warning until an eruption began might lead to thousands of deaths, so the volcanologists were under some pressure to deliver a timely and accurate assessment of the volcanic risk. Three successive evacuation zones were defined, the innermost containing everything within 10 km (6.2 mi) of the volcano's summit, the second extending 10–20 km (6.2–12.4 mi) from the summit, and the third extending from 20–40 km (12–25 mi) from the summit (Clark Air Base and Angeles City were in this zone). The 10 km (6.2 mi) and 10–20 km (6.2–12.4 mi) zones had a total population of about 40,000 inhabitants, while some more 331,000 inhabitants lived in the 20–40 km (12–25 mi) zone. Five stages of volcanic alert were defined, from level 1 (low level seismic disturbances) up to level 5 (major eruption in progress). Daily alerts were issued stating the alert level and associated danger area, and the information was announced in major regional and national newspapers, on radio and television stations, by nongovernmental organizations (NGOs) and directly to the endangered inhabitants. Many of the Aetas who lived on the slopes of the volcano left their villages of their own volition when the first blasts began in April, gathering in a village about 12 kilometres (7.5 mi) from the summit. They moved to increasingly distant settlements as the eruptions escalated, some Aetas moving up to nine times in the two months before the colossal eruption. The first formal evacuations were ordered for the 10 km (6.2 mi) zone on April 7. Evacuation of the 10–20 km (6.2–12.4 mi) zone was ordered when a level 4 alert was issued on June 7. A level 5 alert triggered evacuation of the 20–40 km (12–25 mi) zone on June 13, and in all some 60,000 people had left the area within 30 kilometres (19 mi) of the volcano before June 15. Most people temporarily relocated to Metro Manila, with some 30,000 using the Amoranto Velodrome in Quezon City as an evacuee camp. The eruption cloud shortly before the colossal climactic eruption. The second-largest volcanic eruption of the 20th century, and by far the largest eruption to affect a densely populated area, occurred at Mount Pinatubo on Saturday, June 15, 1991. The eruption produced high-speed avalanches of hot ash and gas, massive lahar floods and huge clouds of superheated volcanic material hundreds of kilometers across. In early June, tiltmeter measurements had shown that the volcano was gradually inflating, evidently due to fast-growing amounts of magma filling the reservoir beneath the summit. At the same time, seismic activity, previously concentrated at a depth of a few kilometers below a point about 5 kilometres (3.1 mi) northwest of the summit, shifted to shallow depths just below the summit. On June 7, the first magmatic eruptions took place with the formation of a lava dome at the summit of the volcano. The dome grew substantially over the next five days, reaching a maximum diameter of about 200 m (660 ft) and a height of 40 m (130 ft). Timely forecasts of an eruption by scientists from the Philippine Institute of Volcanology and Seismology and the U.S. Geological Survey enabled people living near the volcano to quickly evacuate to safer distances, saving at least 5,000 lives. A small blast at 03:41 PST on June 12 marked the beginning of a new, more violent phase of the eruption. A few hours later the same day, massive blasts lasting about half an hour generated big eruption columns, which quickly reached heights of over 19 kilometres (62,000 ft) and which generated large pyroclastic surges extending up to four kilometres (2.5 mi) from the summit in some river valleys. Fourteen hours later, a 15-minute blast hurled volcanic matter to heights of 24 km (79,000 ft). Friction in the up-rushing ash column generated abundant lightning. A third large eruption began at 08:41 on June 13, after an intense swarm of small earthquakes over the previous two hours. It lasted about five minutes, and the eruption column once again reached 24 kilometres. After three hours of quiet, seismic activity began, growing more and more intense over the next twenty-four hours, until a three-minute eruptive blast generated a 21 km (69,000 ft) high eruption column at 13:09 on June 14. Tephra fall from these four large eruptions was extensive to the southwest of the volcano. Two hours after the last of these four explosions, a series of eruptions began which lasted for the next twenty-four hours, and which saw the production of much larger pyroclastic flows and surges which travelled several kilometres down river valleys on the flanks of the volcano. Dacite was the dominant igneous rock making up the tephra in these eruptions and in the following climactic event. The most abundant phenocryst minerals were hornblende and plagioclase, but an unusual phenocryst mineral was also present – the calcium sulfate called anhydrite. The dacite magma was more oxidized than most magmas, and the sulfur-rich nature of the eruption was probably causally related to the redox state. The final, massive eruption of Mount Pinatubo began at 13:42 PST on June 15. It caused numerous major earthquakes due to the collapse of the summit and the creation of a caldera 2.5 km (1.6 mi) in diameter, reducing the peak from 1,745 m (5,725 ft) to 1,485 m (4,872 ft). All the seismographs close to Clark Air Base had been rendered completely inoperative by 14:30, mostly by super-massive pyroclastic surges. Intense atmospheric pressure variation was also recorded. On the same day, Typhoon Yunya, locally named Diding, struck the island, with its center passing about 75 km (47 mi) north of the volcano. The typhoon rains mostly obscured the eruption, but measurements showed that ash was ejected to 34 km (112,000 ft) high by the most violent phase of the eruption, which lasted about three hours. Pyroclastic surges poured from the summit, reaching as far as 16 km (9.9 mi) away from their origin point. Typhoon rains mixed with the ash deposits caused a messy rain of mud and massive lahars. The volcanic column from the crater covered an area of some 125,000 km2 (48,000 sq mi), bringing total darkness to much of Central Luzon. Almost all of the island received some wet ash fall, which formed a heavy, rain-saturated snow-like blanket. Tephra fell over most of the South China Sea and ash falls were recorded as far away as Vietnam, Cambodia, Singapore, Malaysia and Indonesia. Twelve days after the first magmatic eruptions of June 3, on June 15, 1991, by about 22:30, and about nine hours after the onset of the most recent climactic phase, atmospheric pressure waves had decreased to the pre-eruption levels. No seismic records were available at this time, but volcanologists believe 22:30 PST marked the end of the climactic eruption. Vast quantities of minerals and metals were brought to the surface. Overall, introduced to the surface environment was an estimated 800,000 t (880,000 short tons) of zinc, 600,000 t (660,000 short tons) of copper, 550,000 t (610,000 short tons) of chromium, 300,000 t (330,000 short tons) of nickel, and massive amounts of toxic heavy metals such as 100,000 t (110,000 short tons) of lead, 10,000 t (11,000 short tons) of arsenic, 1,000 t (1,100 short tons) of cadmium, and 800 t (880 short tons) of mercury. At least 16 commercial aircraft made damaging in-flight encounters with the ash cloud ejected by the June 15 eruption, as did other aircraft on the ground. The encounters caused loss of power to one engine on each of two aircraft. Ten engines were damaged and replaced, including all three engines of one DC-10. Longer term damage to aircraft and engines was reported, including accumulation of sulphate deposits on engines. The eruption also irreparably damaged the Philippine Air Force's recently retired fleet of Vought F-8s, as these were in open storage at Basa Air Base at the time. The June 15 eruption had a volcanic explosivity index (VEI) of 6, and came some 450–500 years after the volcano's last known eruptive activity. The eruption ejected about 10 km3 (2.4 cu mi) of material, making it the largest eruption since that of Novarupta in 1912 and some ten times larger than the 1980 eruption of Mount St. Helens. Ejected material such as tephra fallout and pyroclastic flow deposits are much less dense than magma, and the volume of ejected material was equivalent to about four cubic kilometres (0.96 cu mi) of unerupted material. The former summit of the volcano was obliterated and replaced by a caldera 2.5 km (1.6 mi) wide. The highest point on the caldera rim now stood 1,485 m (4,872 ft) above sea level, some 260 m (850 ft) lower than the pre-eruption summit. A reported 847 people were killed by the eruption, mostly by roofs collapsing under the load of accumulated volcanic matter, a hazard amplified by the simultaneous arrival of Typhoon Yunya. The evacuation in the days before the eruption certainly saved tens of thousands of lives, and has been hailed as a great success for volcanology and eruption prediction. After the eruption, about 500,000 people continue to live within 40 km (25 mi) of the volcano, with population centers including the 150,000 in Angeles City and 30,000 at Clark Freeport Zone. Many reforestation projects were destroyed in the eruption, with a total area of 150 km2 (58 sq mi; 37,000 acres) valued at 125 million pesos destroyed. Agriculture was heavily disrupted, with 800 km2 (310 sq mi; 200,000 acres) of rice-growing farmland destroyed, and almost 800,000 head of livestock and poultry killed, destroying the livelihoods of thousands of farmers. The cost to agriculture of eruption effects was estimated to be 1.5 billion pesos. Many farmers near Pinatubo began growing crops such as peanuts, cassava and sweet potatoes, which are quick-ripening and could be harvested before the threat of lahar floods during the late summer rainy season. A Space Shuttle (Mission STS-43) photograph of the Earth over South America taken on August 8, 1991, showing double layer of Pinatubo aerosol cloud (dark streaks) above high cumulonimbus tops. In total, 364 communities and 2.1 million people were affected by the eruption, with livelihoods and houses being damaged and destroyed. More than 8,000 houses were completely destroyed, and a further 73,000 were damaged. In addition to the severe damage sustained by these communities, roads and communications were damaged or destroyed by pyroclastic surges and lahar floods throughout the areas surrounding the volcano. Total losses in 1991 and 1992 alone were estimated at 10.6 and 1.2 billion pesos respectively, including damage to public infrastructure estimated at 3.8 billion pesos (c. US$92 million, or $169 million today, adjusted for inflation). Education for thousands of children was seriously disrupted by the destruction of schools in the eruption. The eruption of Pinatubo severely hampered the economic development of the surrounding areas. The gross regional domestic product of the Pinatubo area accounted for about 10% of the total Philippine gross domestic product. The GRDP had been growing at 5% annually before the eruption, but fell by more than 3% from 1990 to 1991. In 1991, damage to crops and property was estimated at $374 million (or $688 million today), to which continuing lahar floods added a further $69 million (or $123 million today) in 1992. In total, 42 percent of the cropland around the volcano was affected by more lahar floods, dealing a severe blow to the agricultural economy in the region. Before and after the eruption: a river valley filled in by pyroclastic flow deposits. Since the eruption, each heavy rain has brought massive lahars from the volcano, displacing thousands of people and inflicting extensive damage to buildings and infrastructure costing billions to repair. A large[quantify] supply of funds were spent in constructing dikes and dams to control the post-eruption lahar flows. Several important river systems stem from Mount Pinatubo, the major rivers being the Abacan, Tarlac, Pasig-Potrero, Sta. Lucia, Bucao, Santo Tomas, Maloma, Tanguay, Ashley and Kileng rivers. Before the eruption, these river systems were important ecosystems, but the eruption filled many valleys with deep pyroclastic deposits. Since 1991, the rivers have been clogged with sediment, and the valleys have seen frequent lahars which continued for years after the eruption. Studies show that the river systems will take decades to recover from the June 1991 eruption. On September 3, 1995, a lahar buried San Guillermo Parish Church to half its 12 m (39 ft) height. The United States Air Force initiated a massive airlift effort to evacuate American service members and their families from the two affected bases during and immediately following the eruption, named Operation Fiery Vigil. Most personnel were initially relocated to Guam, Okinawa and Hawaii, although some returned to the continental United States. Clark Air Base was ultimately abandoned by the United States military, and Subic Bay reverted to Philippine control the next year following the breakdown of lease negotiations. 2 of about 17,000,000 t (19,000,000 short tons) being injected – the largest volume ever recorded by modern instruments (see chart and figure). Satellite measurements of ash and aerosol emissions from Mount Pinatubo. This very large stratospheric injection resulted in a reduction in the normal amount of sunlight reaching the Earth's surface by roughly 10% (see figure). This led to a decrease in northern hemisphere average temperatures of 0.5–0.6 °C (0.9–1.1 °F) and a global fall of about 0.4 °C (0.7 °F). At the same time, the temperature in the stratosphere rose to several degrees higher than normal, due to absorption of radiation by the aerosol. The stratospheric cloud from the eruption persisted in the atmosphere for three years after the eruption. While not directly responsible, the eruption may have played a part in the formation of the 1993 Storm of the Century. The eruption had a significant effect on ozone levels in the atmosphere, causing a large increase in the destruction rate of ozone. Ozone levels at middle latitudes reached their lowest recorded levels, while in the southern hemisphere winter of 1992, the ozone hole over Antarctica reached its largest ever size until then, with the fastest recorded ozone depletion rates. The eruption of Mount Hudson in Chile in August 1991 also contributed to southern hemisphere ozone destruction, with measurements showing a sharp decrease in ozone levels at the tropopause when the aerosol clouds from Pinatubo and Hudson arrived. The Aeta people were the hardest hit by the eruption. After the areas surrounding the volcano were declared safe, many Aetas returned to their old villages only to find them destroyed by pyroclastic and lahar deposits. Some were able to return to their former way of life, but most moved instead to government-organized resettlement areas. Conditions on these were poor, with each family receiving only small plots of land not ideal for growing crops. Many Aeta found casual labor working for lowland farmers, and overall Aeta society became much more fragmented, and reliant on and integrated with lowland culture. The government implemented several rehabilitative and reconstructive programs. Projects that will help deal with the aftermath brought about by lahar were also implemented. Among these is the construction of mega dikes. Moreover, to hasten the implementation of the basic services for the afflicted, private sectors, including the NGOs, took part in offering relief. They provided support and coordinated on the services that were deemed lacking from the side of the government. After the eruption, many of the homes were destroyed and many of the areas affected by lahar were deemed uninhabitable. There was need to resettle the people particularly the Aetas and lowlanders. Resettlement for these two need to take into consideration the factors of their socio-cultural and socioeconomic differences. Faced with the destruction of many of the farmlands and the displacement of farmers and other workers the government had to search for a long term solution to address the issue. Agricultural based industries were also greatly affected. Closure of Clark Air base also raised an issue of finding short term livelihoods and the need to use the base lands to cushion the repercussions of the worker’s displacement. The destruction brought about by the incident pressured social service sectors to continue their efforts in providing assistance in terms of health, social welfare and education. The services offered are not limited to the victims within the evacuation centers but also offered to the others affected. While the event happened during the opening of a school year, classes were needed to be push back as school facilities were destroyed. Providing resettlement for the evacuees was also a major concern. Social services was also provided in the prospective resettlement areas to prepare the victims when settling down. Destruction of many infrastructures was mostly due to the wet ash after the explosion. The region’s roads, bridges, public buildings, facilities, communication and structures for river and flood control were some of the great concerns of the government. A need to establish measures for the flash floods and the threat caused by lahar also became an imperative demand to the government. The aftereffects of the eruption damaged not only man-made structures but also farmlands, forestlands and watershed. River systems and overall environment of the affected region are also heavily damaged by the heavy lahar flow. To address this careful replanning of the land area region is necessary. This event showed the need to engage in scientific studies to reassess the current policies and knowledge on areas with risk of eruption. Studies should also be allocated on possible application for the ash fall for industrial and commercial purposes. The significance of this concern affects both the government and private sectors. Even before the Philippine government officially appealed for international assistance, the Office of U.S. Foreign Disaster Assistance (USAID/OFDA) shipped shelter material for victims of the floods and lahars in late July 1992. In the following month, they provided $375 000 to be used for relief and rehabilitation projects. The Department of Social Welfare and Development had claimed during an informal donors’ meeting with representatives from mostly international agencies who compose the donor community that the national government was still well-equipped and had sufficient resources to aid the victims. The UN-Disaster Management Team (DMT) and the United Nations’ Department of Humanitarian Affairs/United Nations Disaster Relief Organization (DHA/UNDRO) continued cooperating with the national government to monitor the situation and formulate ideas for further assistance. It was not until the then-President Fidel V. Ramos had declared the affected provinces and areas to be in a state of emergency that the national government officially requested for international assistance and for aid in projects for rehabilitation and relief provisions in the aforementioned areas. In response to this, the DHA/UNDRO reached out to the international community to respond to the appeal, and continued their operations, coordinating with the government. Among the countries that extended humanitarian relief assistance are United States, Canada, UK, Germany, Japan, China, Singapore, Saudi Arabia, Netherlands, Norway, Sweden, Spain, New Zealand, Finland, France, Italy, Denmark, Belgium, Australia, India, South Korea, Thailand, Indonesia, Malaysia, Malta, and Myanmar. International organizations which includes WHO, UNDP, UNICEF, UNDRO, and WFP also offered assistance. Relief assistance from these organizations and countries were in the form of either cash donation or relief items such as food packs, medicines, and shelter materials. Following the climactic eruption of June 15, 1991, activity at the volcano continued at a much lower level, with continuous ash eruptions lasting until August 1991 and episodic eruptions continuing for another month. Activity then remained low until July 1992 when a new lava dome started growing in the caldera. Volcanologists suspected that further violent eruptions could be possible, and some areas were evacuated. However, the eruption was only minor, and since that episode, the volcano has been quiet. The 1991 caldera afterwards filled with water from annual monsoon rains and a crater lake, Lake Pinatubo, was formed. In 1992, a growing lava dome formed an island, which was eventually submerged by the lake. Initially, the lake was hot and highly acidic, with a minimum pH of 2 and a temperature of about 40 °C (104 °F). Subsequent rainfall cooled and diluted the lake, lowering the temperature to 26 °C (79 °F) and raising the pH to 5.5 by 2003. The lake deepened by about one metre (3.3 ft) per month on average, eventually submerging the lava dome, until September 2001, when fears that the walls of the crater might be unstable prompted the Philippine government to order a controlled draining of the lake. An estimated 9,000 people were once again evacuated from surrounding areas in case a large flood was accidentally triggered. Workers cut a five-metre (16 ft) notch in the crater rim and drained about a quarter of the lake's volume. On July 10, 2002, the west wall of the crater collapsed, slowly releasing approximately 160 million cubic metres (5.7 billion cubic feet) of water and sediments into the Maraunot River in Botolan, Zambales. On July 26, 2011, a 5.9 magnitude earthquake struck close to Pinatubo; however, no major damages or casualties were reported. The word pinatubo could mean "fertile place where one can make crops grow", or could mean "made to grow", in Sambal and Tagalog, which may suggest a knowledge of its previous eruption in about 1500 AD. There is a local oral tradition suggestive of a folk memory of earlier large eruptions. An ancient legend tells of Bacobaco, a terrible spirit of the sea, who could metamorphose into a huge turtle and throw fire from his mouth. In the legend, when being chased by the spirit hunters, Bacobaco flees to the mountain and digs a great hole in its summit showering the surrounding land with rock, mud, dust and fire for three days; howling so loudly that the earth shakes. Aeta elders tell many stories about the history of the mountain, the best known being that it was once a Batung Mabye (Kapampangan language for "living stone"). It was said to have been planted on a kingdom by a displeased sorcerer but relocated by a hero. The mountain was soon turned into the abode of Apo Namalyari ("The lord of happenings/events"), the pagan deity of the Sambal, Aetas and Kapampangans living on the Zambales range. It was said to comprise the whole mountain range until Sinukuan of Mount Arayat (the god of the Kapampangans) became a strong rival of Namalyari. Their fight, which took place over the center plains, shattered the mountain into smaller bodies and Mount Arayat lost its center peak. Other versions have it that Pinatubo's peak shattered because of Namalyari's immense fury in an attempt to teach humans the meaning of fear and show how misdeeds will be punished. According to the native elders, Apo Namalyari induced the June 1991 eruption because of displeasure toward illegal loggers and Philippine National Oil Company executives who performed deep exploratory drilling and well testing on the volcano looking for geothermal heat from 1988 to 1990. Discouraging results from the wells forced the abandonment of the prospect 13 months before the April 2, 1991 explosions. After being driven away by the 1991 eruption of Mount Pinatubo, in May 2009 some 454 Aeta families in Pampanga were given the first clean ancestral land ownership on Mount Pinatubo with the Certificate of Ancestral Domain Title (CADT) by the National Commission on Indigenous Peoples (NCIP), the government agency that deals with issues concerning indigenous people of the Philippines. The approved and declared net land area of 7,440.1 ha (18,385 acres) covers the barangays of Mawakat and Nabuklod in Floridablanca, Pampanga, plus a portion of San Marcelino, Zambales, and a portion of Barangay Batiawan in Subic, Zambales. On January 14, 2010, some 7,000 Aeta families from Zambales were officially granted the Certificate of Ancestral Domain Title (CADT) covering the Zambales side of Pinatubo which includes the summit and Lake Pinatubo, officially becoming their lutan tua (ancestral land). The ancestral domain title covers 15,984 ha (39,500 acres) and includes the villages of Burgos, Villar, Moraza and Belbel in Botolan and portions of the towns of Cabangan, San Felipe and San Marcelino. Having the land title will protect them from others — including foreigners — exploiting their land without compensation and consent to the indigenous tribes. In the past, the Aetas had to contend with mining companies, loggers, and recently, tourist companies who earn from Mount Pinatubo but do not compensate the local tribes. Ancestral domain titles are awarded to a certain community or indigenous group who have occupied or possessed the land continuously in accordance with their customs and traditions since time immemorial. They have the legal right to collectively possess and to enjoy the land and its natural resources to the exclusion of others. Long before Mt. Pinatubo became famous for its cataclysmic eruption, Philippine President Ramon Magsaysay, a native of Zambales, named his C-47 presidential plane Mt. Pinatubo. The plane crashed in Mount Manunggal in Cebu province in 1957, killing the President and twenty-four others on board. The caldera formed and Lake Pinatubo has since become a tourist attraction with the preferred route through Barangay Santa Juliana in Capas, Tarlac. ^ a b Pinatubo, Global Volcanism Program. ^ "Pinatubo Volcano". The Philippine Institute of Volcanology and Seismology (PHIVOLCS). Archived from the original on 2009-01-29. Retrieved 2008-08-12. ^ "Tarlac map". University of Texas in Austin Library. Retrieved 2011-08-02. ^ a b "The Cataclysmic 1991 Eruption of Mount Pinatubo, Philippines". Retrieved 2007-04-09. ^ Stephen Self; Jing-Xia Zhao; Rick E. Holasek; Ronnie C. Torres & Joey McTaggart (1999). "The Atmospheric Impact of the 1991 Mount Pinatubo Eruption". Retrieved July 25, 2014. ^ a b "Mt. Pinatubo's cloud shades global climate". Science News. Retrieved 2010-03-07. ^ Tactical Pilotage Chart, Sheet K-11B, Defense Mapping Agency, Department of Defense, 1982. ^ U.S. War Department. "Report of the Philippine Commission, 1901 Vol. III"), pg. 141. Government Printing Office, Washington. ^ Topinka, Lyn (July 13, 2009). "Description: Mount Pinatubo, Philippines". United States Geological Survey. Retrieved April 18, 2010. ^ a b c d e f g h Newhall, Christopher G.; Punongbayan, Raymundo S., eds. (1996). "Eruptive history of Mount Pinatubo". FIRE and MUD: Eruptions and Lahars of Mount Pinatubo, Philippines. Philippine Institute of Volcanology and Seismology; University of Washington Press. ISBN 978-0-295-97585-6. 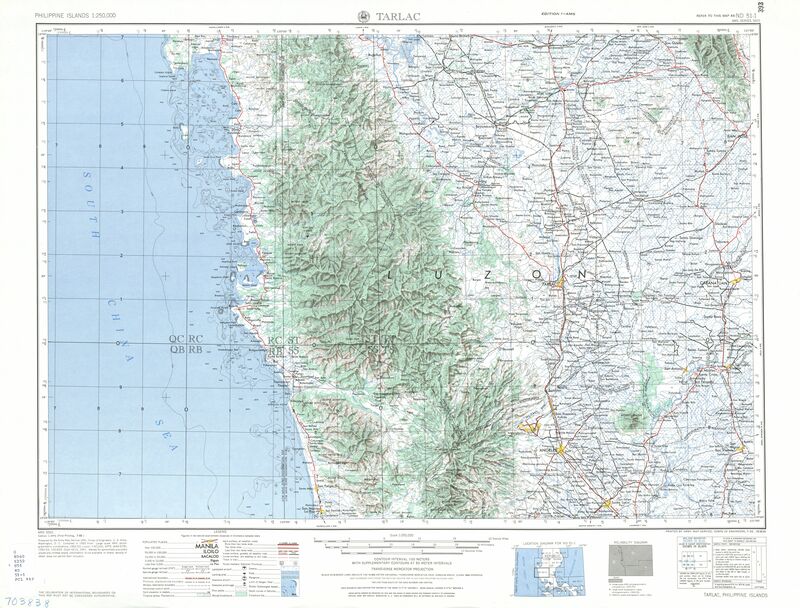 ^ USGS. "Earthquake Information for 1990". Archived from the original on 2009-12-06. Retrieved 2010-03-06. ^ Factoran, Fulgencio Jr. S. (2001). "The July 16 Luzon Earthquake: A Technical Monograph". Inter-Agency Committee for Documenting and Establishing Database on the July 1990 Earthquake. Philippine Institute of Volcanology and Seismology. Archived from the original on 2008-09-07. Retrieved 2009-01-07. ^ a b "The Cataclysmic 1991 Eruption of Mount Pinatubo, Philippines". U.S. Geological Survey Fact Sheet 113-97. U.S. Geologic Survey. 1997. ^ Rosenberg, Matt. "Mount Pinatubo Eruption – The Volcanic Mount Pinatubo Eruption of 1991 that Cooled the Planet". ^ Garret, R.G. (November 2000). "Natural sources of metals in the environment". Human and Ecological Risk Assessment: An International Journal. 6 (6): 945–963. doi:10.1080/10807030091124383. ^ "In 1991, it was Pinatubo". Philippine Daily Inquirer. April 17, 2010. Archived from the original on April 17, 2015. ^ Philippine Air Force. "Philippine Air Force: F-8 Crusader". Philippine Air Force. Archived from the original on 2007-06-25. Retrieved 10 November 2013. ^ "Mt. Pinatubo, Luzon, Philippines". National Geophysical Data Center (U.S. NOAA). Retrieved 2007-12-02. ^ "Ashfall, Pyroclastic Flow, Lahar: The Aftermath". Pinatubu Volcano: The Sleeping Giant Awakens. expo.edu.ph. Archived from the original on 2011-07-26. ^ a b c Reilly 2009, p. 70. ^ Joan Martí; Gerald Ernst (2005). Volcanoes and the environment. Cambridge University Press. pp. 450. ISBN 978-0-521-59254-3. ^ Reilly 2009, p. 69. ^ Ward, Peter L. (2 April 2009). "Sulfur Dioxide Initiates Global Climate Change in Four Ways" (PDF). Thin Solid Films. 517 (11): 3188–3203. Bibcode:2009TSF...517.3188W. doi:10.1016/j.tsf.2009.01.005. Archived from the original (PDF) on 20 January 2010. Retrieved 2010-03-19. ^ Stevens, William (March 14, 1993). "THE BLIZZARD OF '93: Meteorology; 3 Disturbances Became a Big Storm". The New York Times. Retrieved July 29, 2014. ^ Shimizu, Hiromu (2002), Struggling for Existence after the Pinatubo Eruption 1991: Catastrophe, Suffering and Rebirth of Ayta Communities. Paper presented inter-congress of the International Union of Anthropological and Ethnological Sciences, Tokyo, Japan. Retrieved from the original on August 15, 2004. ^ "Philippines Mt Pinatubo Volcanic Eruption Aug 1992 UN DHA Situation Reports 1–8". ReliefWeb. 1992-08-20. Retrieved 2017-07-08. ^ "Filipinos return as volcano lake drains". BBC News. September 7, 2001. ^ Gonzaga, Robert and Orejas, Tonette (2011-07-26). "5.9-magnitude quake jolts households in Luzon, Metro areas". Inquirer News. ^ Loeb, Vernon (1991-07-21). "Natives Who Worship Pinatubo Feel Its Wrath". Seattle Times. Retrieved 2008-11-22. ^ Delfin Jr., F.G., Villarosa, H.G.. "Geothermal Exploration of the pre-1991 Mount Pinatubo Hydrothermal System". USGS. Retrieved on 2011-08-14. ^ (2009-05-27). "Aetas in Pampanga awarded first clean title of ancestral domain". Scribd. Retrieved on 2011-08-14. ^ Orejas, Tonette (2009-11-27). "It’s official: Pinatubo is now owned by Aetas" Archived 2011-11-18 at the Wayback Machine. PIPLinks (originally from Philippine Daily Inquirer). Retrieved on 2011-08-14. ^ a b c Valdez, Katrina Mennen A. (2010-01-14). "Aetas to receive title to domain at Mt. Pinatubo" Archived 2013-04-15 at Archive.today. Preda Foundation. Retrieved on 2011-08-14. ^ Dominico C. Moneva (2006-03-18). "Speak out: Magsaysay's death". Sun Star Cebu. Archived from the original on 2008-05-17. Retrieved 2008-03-21. ^ "Trekking-Mt-Pinatubo". inquirer.net. 2010-05-29. Archived from the original on 14 November 2012. Retrieved 13 June 2012. McCormick, M. Patrick; et al. (1995). "Atmospheric effects of the Mt Pinatubo eruption". Nature. 373 (6513): 399–404. Bibcode:1995Natur.373..399M. doi:10.1038/373399a0. Rantucci, Giovanni (1994). Geological Disasters In The Philippines: The July 1990 Earthquake And The June 1991 Eruption of Mount Pinatubo. Description, effects and lessons learned. Philippine Institute of Volcanology and Seismology (PHIVOLCS). ISBN 978-0-7881-2075-6. Retrieved 2009-08-15. Reilly, Benjamin (2009). Disaster and human history: case studies in nature, society and catastrophe. McFarland. ISBN 978-0-7864-3655-2. Scaillet, B. and Evans, B. W. (1999) The June 15, 1991 Eruption of Mount Pinatubo. I. Phase Equilibria and Pre-eruption P–T–fO2–fH2O Conditions of the Dacite Magma. Journal of Petrology, v. 40, 381–411. 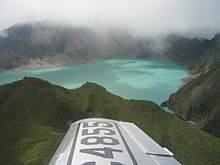 Wikimedia Commons has media related to Mount Pinatubo. Weather effects of the 1991 eruption EOS Volcanology.